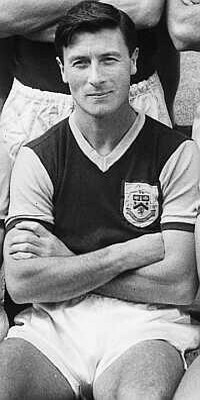 It was now over a week since Frank Casper's resignation after which chairman Frank Teasdale promised a quick appointment, but things were no closer and as Mullen prepared for what could be his last game at Turf Moor it was still thought that Brian Flynn could be the next man for the job. It was certainly setting up the game nicely - manager elect v caretaker manager, and whilst we were considering that, the deputy sports editor of the Burnley Express, Jimmy McIlroy, was giving his views on the world of managerial changes and what he thought made a good manager. You don't need to look through the records to find how successful a club has been over a number of years - just a glance at the number of managers it has employed will tell the story. So when the records show that Burnley have made twelve managerial changes in the last 33 years - and 14 of those years had one man, Harry Potts, in charge - then obviously things haven't gone well for this old club for well over a decade. We have been told that it was Frank Casper's decision to resign, but undoubtedly it was only because the Clarets' fans have made life hell for him for a long time, that he decided enough was enough. Never mind that he claims their barracking wasn't responsible for his decision; had his team been top of the table I'm certain he still would be in charge at Turf Moor. Now it may surprise some to know that the people I now feel a certain amount of pity for are the directors. They have to carry the can for results almost as much as the manager, especially the poor old chairman who unfairly bears the brunt of the fans wrath. Their appointment is certain not to please everyone, though it will silence the barracking for a week or two that will resound around Turf Moor again in a very short time if results do not improve under the new man. At the time of writing the new manager hasn't been named - and I'm not surprised, because it's an unenviable task deciding who should be given the job of restoring this famous club's fortunes. Just take a look at the list of managers the Burnley board has chosen over three decades: Harry Potts (twice in charge), Brian Miller (twice), Frank Casper (twice), Jimmy Adamson, Joe Brown, John Bond, John Benson, Martin Buchan and Tommy Cavanagh. Now no one could convince me that amongst this line-up there aren't fellows with as much soccer knowledge as anyone in the game, yet, although Harry, Jimmy and Brian enjoyed great triumphs at times they too were vanquished because they were unable to maintain this success. They found themselves on the receiving end of the crowd's wrath. The downfall of ninety-nine out of a hundred managers is brought about by the fans, hastened when it is turned on the directors as well match after match - which isn't surprising; after all it's only a hobby for them and a hobby should provide pleasure not aggro. I've yet to meet a manager who honestly believed he deserved the "boot". They blame a long list of injuries, directors for either selling his best players or not finding the money for him to buy better ones, or the fans for not being patient enough to allow his young players to develop. And I've yet to meet one who fails to claim that he was leaving the club in a stronger position than when he took over. "What makes a good manager," is a question that produces a million answers, and mine is so simple no one accepts it. Everyone thinks there must be more to it than simply "good players". But this is the answer. It hit me like a ton of bricks when the Oldham Athletic team trotted out for my first game as manager - I was only as good as the players I turned out. And I didn't feel like riding on the backs of eleven fellows for the rest of my life. What about motivation? Coaching? Technique? Aren't the top managers blessed with these gifts? Don't they get more of their players than the fellows whose teams languish in the relegation zone? "Poppycock" to quote a retort often used by the late Bob Lord, when chairman of Burnley. Motivation was a word that flooded the football world in the seventies, when there was such a dearth of good players that the media had to create their stars out of managers such as Malcolm Allison, Brian Clough, John Bond, etc. Every game they won was due to the way they motivated players and the tactics they employed - when every team in the plan used the same tactics. As for coaching! If a coach can really improve the skill of players even fractionally, then why are they always wanting to buy new ones? And with every team in the country, right down to schoolboy level, in the hands of coaches, why is there so little skill about? Six years in the Fourth Division is too long for the Burnley fans to accept, and for the best supported team in the lower regions of the Football League it is understandable that they are vociferous when the situation doesn't appear to improve. From the little I've seen of the Clarets I reckon at least three better players are required for promotion. So providing the money is available it wouldn't matter two hoots if Margaret Thatcher got the job - providing she signed the right players.